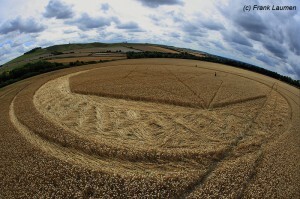 This Crop Circle appeared on Jubilee Plantation in Wiltshire, U.K. on August 15, 2011. It is a magnificent design and demonstrates perfection in its execution. The laid pattern of wheat flowing so gracefully in a gently layered and repeating pattern is reminiscent of water flowing in a stream. This ground shot, taken by Bert Janssen, author of www.CropCirclesandMore.com (thank you for this effort Bert), gives us a glimpse of the smooth and subtle pattern in the laid wheat crop. 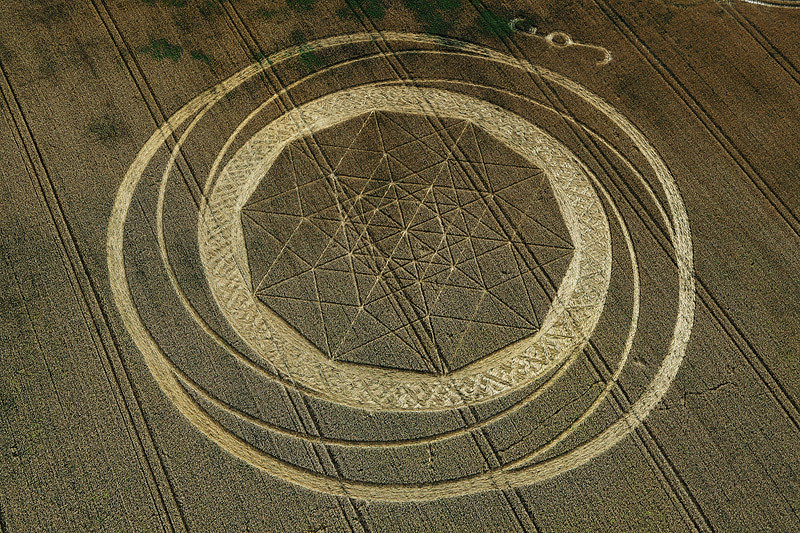 The pattern in the center of this Crop Circle is even more astounding, for it has come to my attention that this complex design represents a very precise 2-dimensional model of the electron-diffraction pattern of an icosahedral Holmium – Magnesium – Zinc quasicrystal which is perfectly contained within the beautiful boundary which circumscribes this 2-dimensional example of a higher-dimensional quasicrystal framework. Not only must we wrestle with the question of how a (human) person(s) might been able to physically access a farmer’s field of wheat and secretly produce a grand-sized and perfectly scaled 2-dimensional rendering of a such a quasicrystals electron-diffraction pattern, but we must also question what person having these incredible skills and this level of daring would be willing to go out in the dark of night, risking arrest, fine, and /or imprisonment for trespassing and vandalism, and would also be aware of this relatively new-to-science concept of a Ho-Mg-Zn quasicrystal’s electron-diffraction pattern? Who indeed? If this was done by one or more persons, then this truly represents Olympic-level human mischief. In my own life, I am presently privileged to work only half-time, I watch very little television, and yet I always seem to feel that I can barely “keep up” with the activities and events which are continually unfolding in my life. It seems that most of us stay quite busy simply trying to maintain the pace required to “keep up” with the demands of our lives. We must ponder how a person would find the time and the inspiration, and have the required knowledge and skill set to produce this and similarly remarkable Crop Circles over and over and over again, perfectly executed without errors, and incorporating such imaginative and relatively obscure themes which we find presented, suddenly and without fanfare or any claim of authorship, in these beautiful and highly original patterns. Now, to be fully burdened by this profound conundrum of what to believe and what not to believe regarding this and many other Crop Circles, you must also be made aware that Dr. Dan Shechtman was awarded the 2011 Nobel Prize in chemistry for his discovery of the quasicrystal. This Nobel Prize was announced to the world on October 5, 2011, and this announcement occurred 51 days after the Jubilee Plantation Crop Circle was created! Could this simply be a highly unlikely coincidence? If it is not, then how could the creators of this design have known of this important and upcoming award so far in advance of the date of the announcement? Perhaps to the creators of the Jubilee Plantation Crop Circle time does not mean what it presently means to you and I, and perhaps this Crop Circle’s reference to higher dimensional space may be a clue to the nature of that ability. “Any sufficiently advanced technology will appear as majic”. Take the time to listen to this interview (below) with Dr. Shechtman as he describes his past experience with his fellow scientists, some of whom were personal friends of Shechtman, following his announcement of his discovery of a quasicrystal on April 2, 1982. Dr. Shechtman’s story is a narrative which also serves well to accurately characterize our civilization’s current impasse in accepting what to myself and a growing minority of others has become self-evident – that we are not alone in this universe. The Jubilee Plantation quasicrystal Crop Circle, many other Crop Circles which are just as miraculous in their physical perfection and the message they bring to us, and the UFO’s which are seen and reported in our skies on a daily basis, are making this fact increasingly clear to those who will open their minds to this new reality. To those inspired individuals immersed in Occupy Wall Street who desire to see a change in our world, you would do well to carefully consider the profound changes which will occur in our world when this new reality becomes fully embraced by our civilization. When that day arrives, business as usual is going to change in a rapid and a dramatic evolution, for we will all then know that another intelligence is watching, and very likely evaluating, just what is transpiring down here. We can already know that this intelligence is clearly interested in our world or we would not be seeing Jubilee, UFO’s, and like phenomenon coming at us with such regularity. They, whoever they are and wherever they come from, are here and they are watching our civilization’s evolution unfold. From this we can also surmise that Free Will is a real and an important driver in our universe, and one that is quite apparently honored by that intelligence responsible for the Jubilee Crop Circle . Each and every day, we individually and collectively self-determine the path we will take to our own and our collective destiny. Those that are observing our social evolution are leaving us hints about their presence here with us and the evidence demonstrates that they remain keenly interested in how our future as a civilization and as stewards of this planet will unfold but, with very few exceptions, are allowing us to choose our own path which will determine our future reality. I regret that I do not have the proper software or expertise to graphically demonstrate for the reader the relationship between the electron-diffraction pattern of a Ho-Mg-Zn quasicrystal and the 2-dimensional model of this that we see manifested in the Jubilee Plantation crop circle of August 15, 2011. I trust that there are those who can and will. 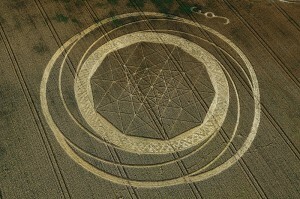 My gratitude to Mark Fussell and Stuart Dike at www.CropCircleConnector.com for making these copyrighted photographs of the Jubilee Plantation Crop Circle available, and to the individual(s), unknown to me, who went to the trouble and expense to take these photos – you must know how important this work will be to our world. Thanks also to Bertold Zugelder, whose accurate diagram of the Jubilee Plantation Crop Circle made this analysis much easier, and thanks to Red Collie who is an inspiration to those of us who might otherwise loose interest. Hey Richard, I hope you are doing well. Excellent article! 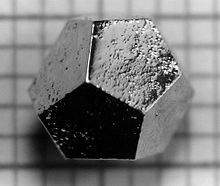 I recognized myself the similarity of the image of the quasicrystal and the Jubilee formation and even made a thread about it on one the popular conspiracy websites a few weeks ago. One would have to assume if the creators of the Jubilee formation are human, then they must be attending high-level conferences in physics and chemistry from which they derive insiration for their creations. Obviously this is more than highly unlikely. Horace Drew has an excellent new essay posted on the Crop Circle Connector where he compares the crop circles as messages from advanced ET to our human scientists attempts to communicate with dolphins by the use of “bubble circles” and studying their reactions to them. I believe that Horace Drew is right on in this line of thinking. Our response to these Crop Circle messages conveys to the senders a great deal of information to them regarding our level of intelligence and our willingness to approach an unknown with an attitude of open and honest inquiry unfettered by social pressures or hidden political agendas. We are prompted to ask “What are these, what do they mean, and who is making them”?, and our reaction to them does much to reveal the most basic positive and negative attributes of how we have constructed our civilization and how we conduct our business. In my judgement the senders must thusfar be disappointed and perhaps even alarmed at the unwillingness of our governments and our scientific communities to critically consider and study the highly unusual (un-Earthly) characteristics displayed by these Crop Circle messages over so many years. I increasingly sense that if we continue down this path much longer human civilization is going to “miss the boat” and squander an important opportunity to benefit from contact with a highly advanced off-world civilization. For this and many other reasons, “business as usual” is becoming an increasingly dangerous choice for mankind. One must have only the most rudimentary grasp of “infinity” to know that this phenomenon is real. I am glad that you too recognized this connection between quasicrystals and the Jubilee formation. This increases my confidence that the connection is solid logic. If you have any other articles you would like to post, please remember to send them my way as well. Dear Richard, I just posted a very similar explanation of Jubilee Plantation on Mark’s CCC website, then found when doing a Google search, that you had already noticed the same idea on December 11! Actually my wife and I were looking out from above the Cherhill White Horse in early July 2011, when I thought that I might see a new crop picture in the field opposite? So I walked quickly down the hill, crossed the road, and rushed through weeds to where the image had been seen, yet there was nothing there. Edgar fouche spoke about quasi crystals in a lecture in 1998. The interesting point is he is an ex employee of Area 51. He was told and shown that the scientists there were working on meta materials as they were reverse engineering material from crashed ufos. His credentials are solid. This was back when quasi crystals were deemed pseudo science. You can watch hid lecture on YouTube. why no mention of Dr Steven Greer on this site?